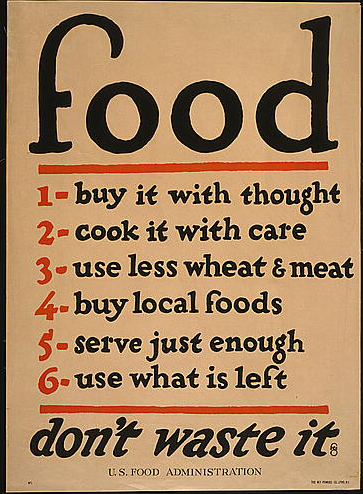 Title: Food--don't waste it / fgc ; The W. F. Powers Co. Litho., N.Y. Medium: 1 print (poster) : lithograph, color ; 73 x 53 cm. Text continues: 1. Buy it with thought 2. Cook it with care 3. Use less wheat and meat 4. Buy local foods 5. Serve just enough 6. Use what is left. 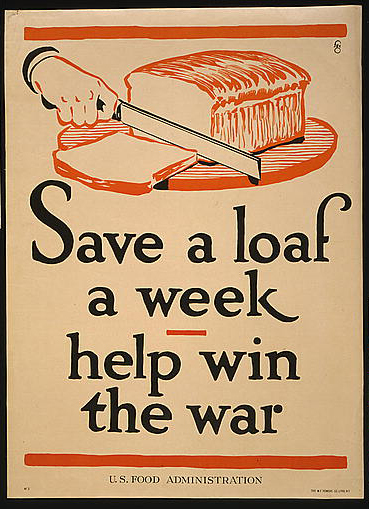 Title: Save a loaf a week - help win the war / fgc ; The W. F. Powers Co. Litho., N.Y. Medium: 1 print (poster) : lithograph, color ; 74 x 54 cm. Summary: Poster showing a loaf of bread being sliced. 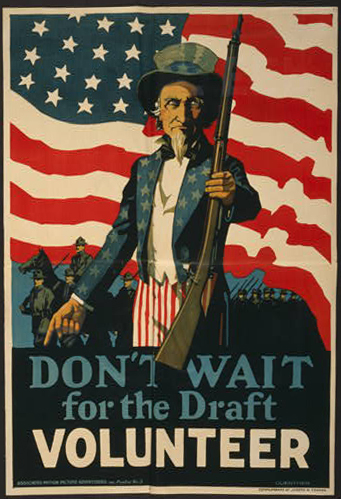 Title: Don't wait for the draft--Volunteer / Guenther. Medium: 1 print (poster) : lithograph, color ; 99 x 67 cm. Summary: Poster showing Uncle Sam, against a backdrop of troops and the American flag, offering a rifle. Associated Motion Picture Advertisers, Inc. Poster No. 3. Compliments of Joseph H. Tooker. Forms part of: Willard and Dorothy Straight Collection. World War, 1914-1918--Recruiting & enlistment--United States. Title: If it's worth living under, it's worth fighting for--Enlist today / Guenther. Medium: 1 print (poster) : lithograph, color ; 94.5 x 60.5 cm. 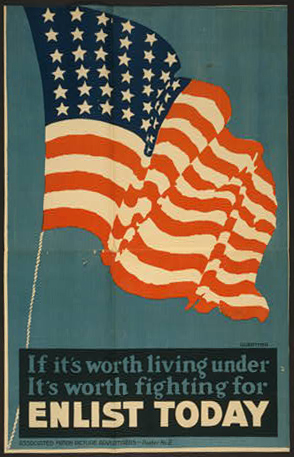 Summary: Poster showing an American flag. Associated Motion Picture Advertisers - Poster no. 2. Title: Hello! This is liberty speaking - billions of dollars are needed and needed now / Z.P. Nikolaki. Medium: 1 print (poster) : lithograph, color ; 31 x 23 cm. 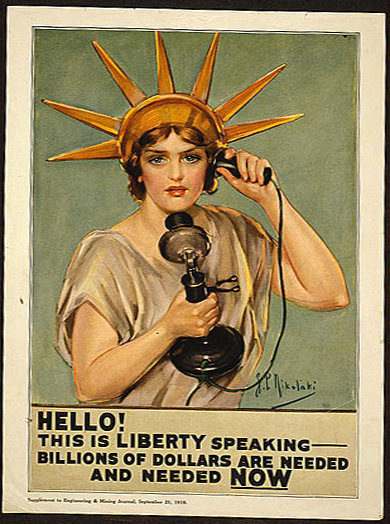 Summary: Statue of Liberty on telephone. Statue of Liberty (New York, N.Y.)--1910-1920. Medium: 1 print (poster) : lithograph, color ; 28 x 53 cm. Summary: Poster showing soldiers marching. 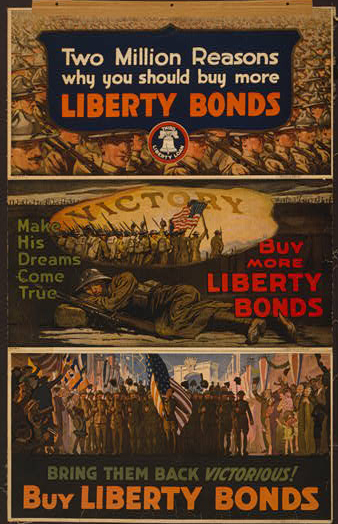 Mounted with other Liberty Loan posters. 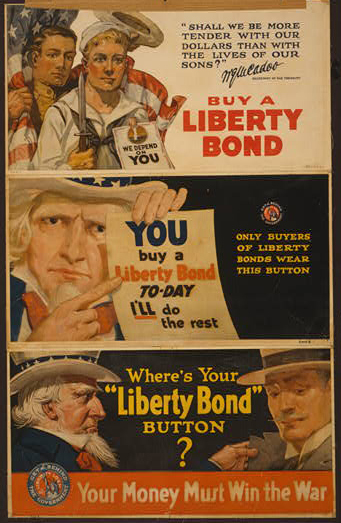 Summary: Poster showing Uncle Sam grasping a man's lapel; below is button "Get behind the government, Liberty Loan of 1917." Medium: 1 print (poster) : lithograph, color ; 50 x 33 cm. 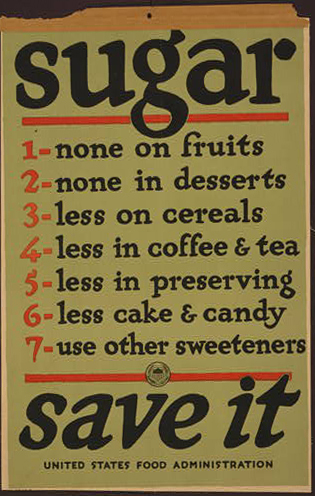 Summary: Poster showing a list of ways to save sugar. Text continues: 1. none on fruits; 2. none in desserts; 3. less on cereals; 4. less in coffee and tea; 5. less in preserving; 6. less cake & candy; 7. use other sweeteners. Title: Operators of small boats enlist now! U.S. Coast Guard / T.A. Byrne. 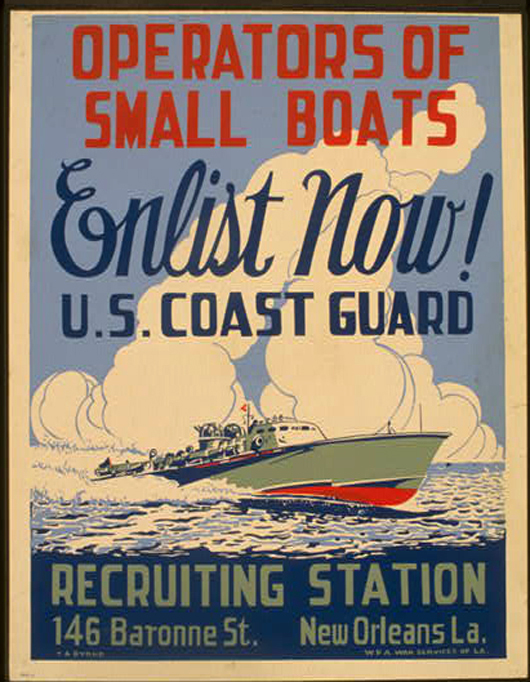 Summary: Poster encouraging boat owners to enlist in the U.S. Coast Guard at the Recruiting Station, 146 Baronne St., New Orleans, La., showing a small Coast Guard boat. Date stamped on recto: Jan 21 '43. Title: Smoking stacks attract attacks Don't invite disaster / / PvP. 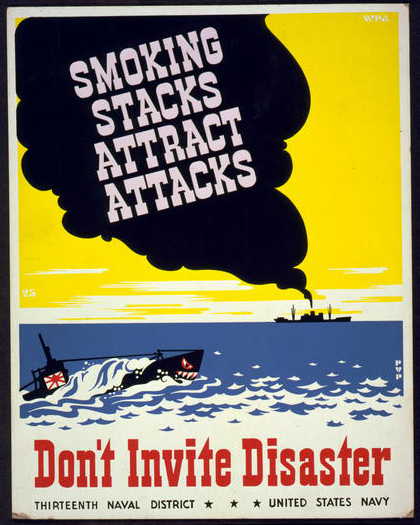 Summary: Poster for Thirteenth Naval District, United States Navy, showing smoke coming from smokestack of ship, Japanese submarine in foreground. Promotional goal: U.S. J26. 1941-43. 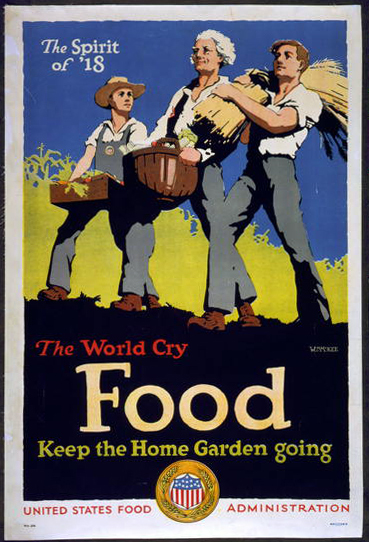 Title: The spirit of '18--The world cry, food--Keep the home garden going / Wm. McKee. Summary: Three people carrying food. Designed for the United States Food Administration. Title: Food is ammunition--don't waste it / J.E. Sheridan. 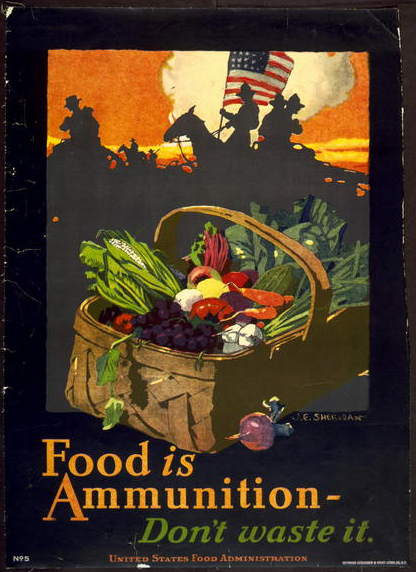 Summary: Produce in basket, soldiers with American flag on horseback in background. Promotional goal: U.S. J7. 1918(?). 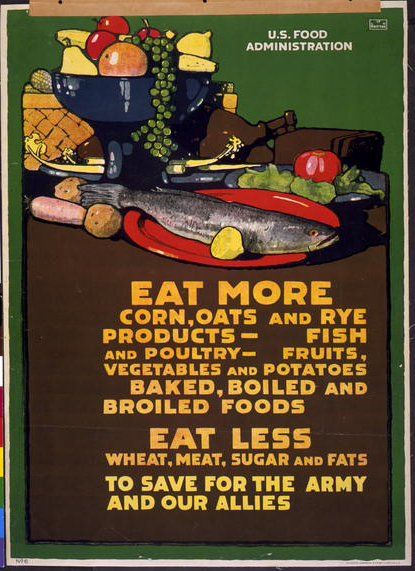 Title: Eat more corn, oats and rye products - ... Eat less wheat, meat, ... / L.N. Britton. Summary: U.S. Food Administration poster, asking for food conservation, illustrated with raw foods on table. Promotional goal: U.S. J7. 1917. Title: Keep mum - the world has ears / Grigware. Summary: Poster for Thirteenth Naval District, United States Navy, showing a woman talking on the telephone and a globe with ears eavesdropping. 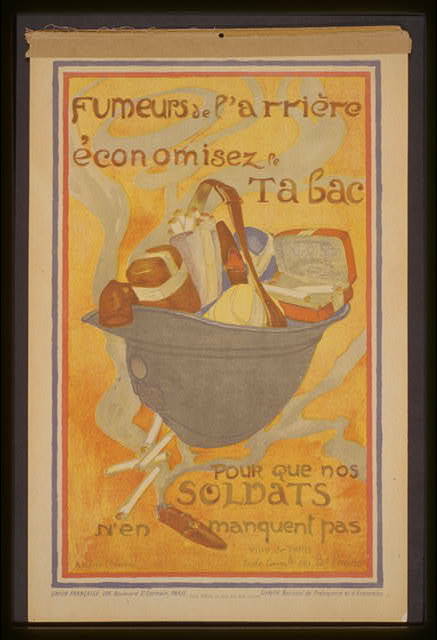 Title: Fumeurs de l'arrière économisez le tabac pour que nos soldats n'en manquent pas / Andrée Ménard. France. Comité national de prévoyance et d'économies. Medium: 1 print (poster) : lithograph, color ; 55 x 36 cm. Summary: A soldier's helmet filled with tobacco products. Translation of title: Civilian smokers, save tobacco for our soldiers. From a group of posters designed by school children and others, some marked "Affiche composée par les enfants de France pour la prévoyance et les économies." Promotional goal: Fr. J72. 1916. Item is no. 223 in a printed checklist available in the Library of Congress Prints and Photographs Reading Room. Title: Travel? Adventure? Answer - Join the Marines! Enlist to-day for 2-3 or 4 years / / James Montgomery Flagg. Medium: 1 print (poster) : lithograph, color ; 101 x 70 cm. 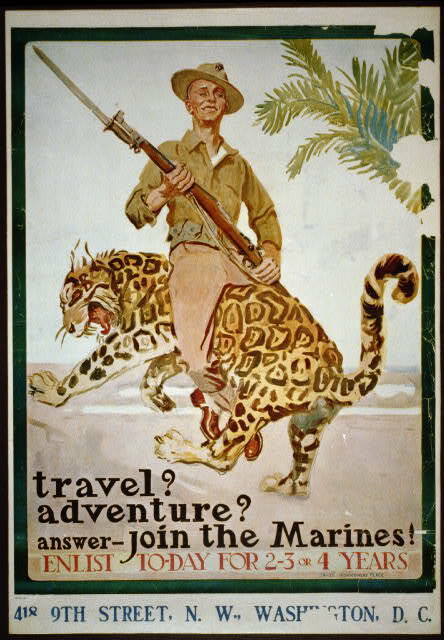 Summary: Poster showing a smiling marine riding backwards on a wild cat, possibly a leopard. 418 9th Street, N.W., Washington, D.C. Title: Are you in this? / RBP ; Printed by Johnson, Riddle & Co., Ltd., London, S.E. Medium: 1 print (poster) : lithograph, color ; 76 x 50 cm. 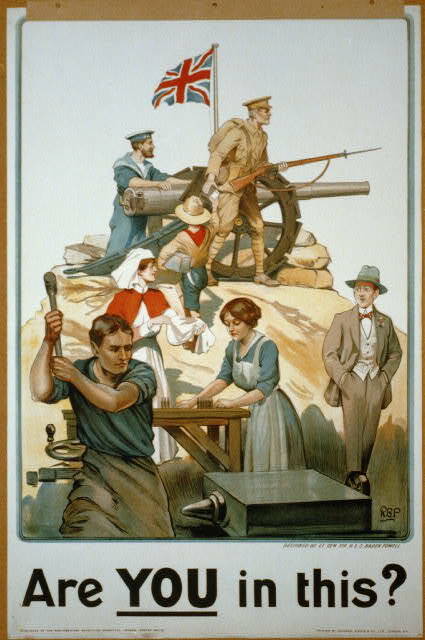 Summary: Poster showing soldiers and others busy with war work, as a well-dressed man looks on pensively. Designed by Lt. Gen. Sir R.S.S. Baden Powell.